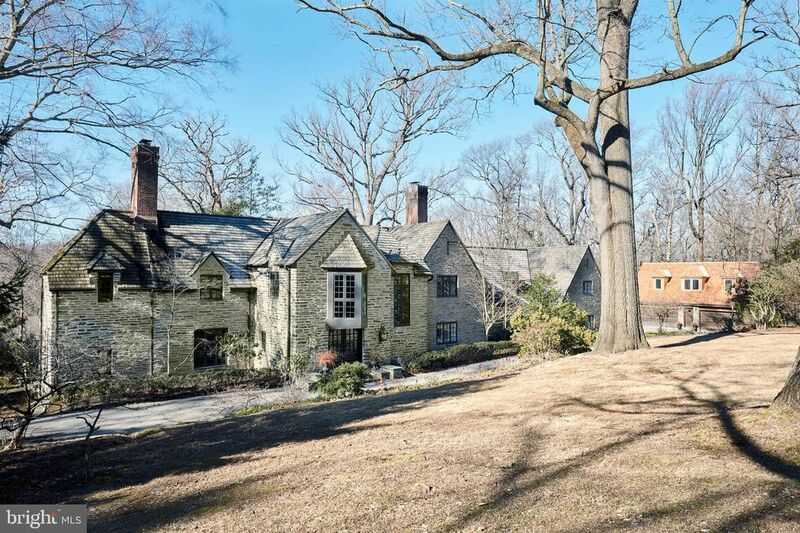 This spectacular property offers the rarest combination of a quintessential 1930's stone, European- style country manor home with charming out buildings, set on a breathtaking 3 acre lot with beautiful pool within minutes of Center City Philadelphia. Enjoy the character of superior old world construction, original restored materials and architectural details, while appreciating the recent sophisticated renovations completed between 2008 and 2019 that suite today's discerning buyers. Features include timeless marble 2-story Entrance Foyer with dramatic main staircase, gracious Living and Dining rooms with original restored fireplaces, mill work, sun-filled windows and French doors leading out to the expansive terraces and grounds, wide plank random width oak floors throughout, renovated Gourmet Kitchen and Butlers Pantry with open access to both the Dining and spacious Family Rooms, convenient Mud Room in close proximity to the over-sized 4-Car Garage with finished/ renovated 2 Bedroom Apartment above, luxurious Master Suite with neutral decor, gorgeous random width oak floors, bright windows, fireplace, original restored millwork, balcony, walk- in His and Hers Closet with custom built-ins and marble Bath with frameless glass shower, whirlpool tub and custom vanities, Second En-Suite Bedroom with its own marble Bathroom, Third and Fourth generous Bedrooms with a renovated marble hall Bathroom, Second Floor Laundry Room, a 5th Nanny Bedroom Suite off of the back staircase, and finished Media Room in the Lower Level. Additional Out Buildings include a charming one bedroom Guest House with renovated Kitchen and Full Bathroom and a multi functional 12 stall Horse/ Party Barn near the beautiful in- ground 2010 Pool/Spa with new decking. All buildings have new roofs installed within last 9 years. Serene, quiet location yet close to renowned Lower Merion schools, Bridlewild Riding Trails, restaurants, shopping, Acela trains, the Airport and 90 minutes from NYC. Move right in! Square Footage in tax records is not correct.